Welcome back to our planetary weather series! Today, we look at Earth’s overheated “sister planet”, Venus! Venus is often called Earth’s “Sister Planet” because of all the things they have in common. They are comparable in size, have similar compositions, and both orbit within the Sun’s habitable zone. But beyond that, there are some notable differences that makes Venus a molten hellhole, and about the last place anyone would want to visit! Much of this has to do with Venus’ atmosphere, which is incredibly dense and entirely hostile to life as we know it. And because of its natural density and composition, the average surface temperature of Venus is hot enough to melt lead. All of this adds up to some pretty interesting weather patterns, which are also incredibly hostile! Although carbon dioxide is invisible, the clouds on Venus are made up of opaque clouds of sulfuric acid, so we can’t see down to the surface using conventional methods. Everything we know about the surface of Venus has been gathered by spacecraft equipped with radar imaging instruments, which can peer through the dense clouds and reveal the surface below. From the many flybys and atmospheric probes sent into its thick clouds, scientists have learned that Venus’ atmosphere is incredibly dense. In fact, the mass of Venus atmosphere is 93 times that of Earth’s, and the air pressure at the surface is estimated to be as high as 92 bar – i.e. 92 times that of Earth’s at sea level. 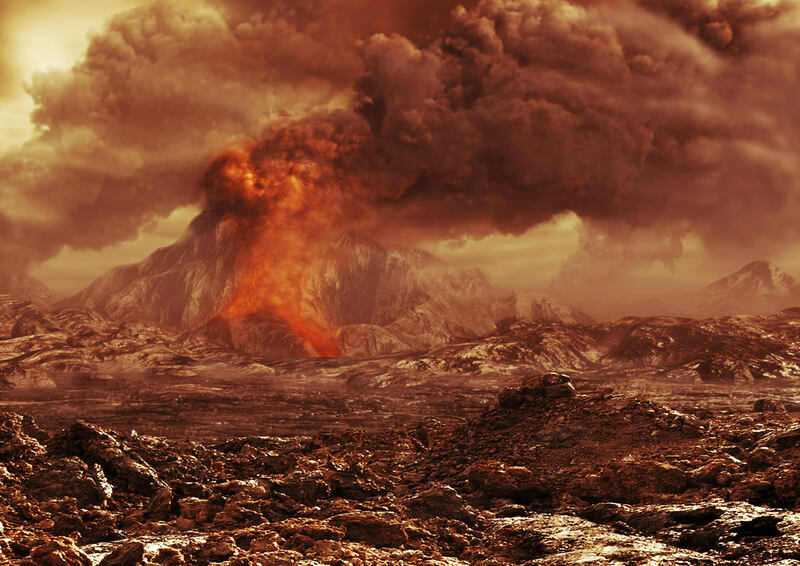 If it were possible for a human being to stand on the surface of Venus, they would be crushed by the atmosphere. The composition of the atmosphere is extremely toxic, consisting primarily of carbon dioxide (96.5%) with small amounts of nitrogen (3.5%) and traces of other gases – most notably sulfur dioxide. Combined with its density, the composition generates the strongest greenhouse effect of any planet in the Solar System. It is also the hottest planet in the Solar System, experiencing mean surface temperatures of 735 K (462 °C; 863.6 °F). Above the dense CO² layer, thick clouds consisting mainly of sulfur dioxide and sulfuric acid droplets scatter about 90% of the sunlight back into space. The planet is also isothermal, which means that there is little variation in Venus’ surface temperature between day and night, or the equator and the poles. The planet’s minute axial tilt – less than 3° compared to Earth’s 23.5° – and its very slow rotational period (the planet takes around 243 days to complete a single rotation) also minimizes seasonal temperature variation. The only appreciable variation in temperature occurs with altitude. The highest point on Venus, Maxwell Montes, is therefore the coolest point on the planet, with a temperature of about 655 K (380 °C; 716 °F) and an atmospheric pressure of about 4.5 MPa (45 bar). The weather on Venus is one of the aspects of the planet under constant study from Earth-based telescopes and space missions to Venus. 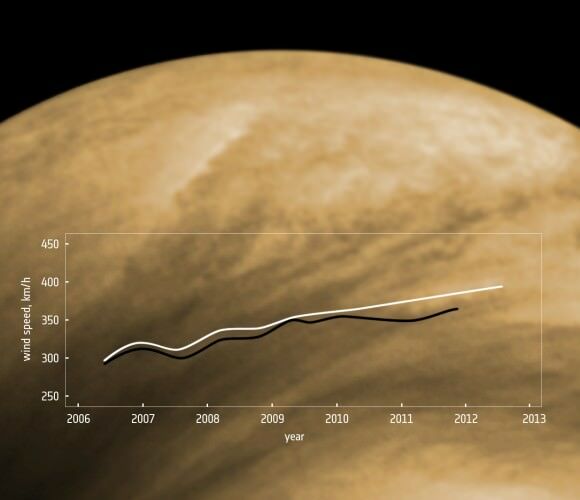 And from what we’ve seen, the weather on Venus is very extreme. The entire atmosphere of the planet circulates around quickly, with winds reaching speeds of up to 85 m/s (300 km/h; 186.4 mph) at the cloud tops, which circle the planet every four to five Earth days. At this speed, these winds move up to 60 times the speed of the planet’s rotation, whereas Earth’s fastest winds are only 10-20% of the planet’s rotational speed. Spacecraft equipped with ultraviolet imaging instruments are able to observe the cloud motion around Venus, and see how it moves at different layers of the atmosphere. The winds blow in a retrograde direction, and are the fastest near the poles. Closer to the equator, the wind speeds die down to almost nothing. Because of the thick atmosphere, the winds move much slower as you get close to the surface of Venus, reaching speeds of about 5 km/h. Because it’s so thick, though, the atmosphere is more like water currents than blowing wind at the surface, so it is still capable of blowing dust around and moving small rocks across the surface of Venus. Several flybys past the planet have also indicated that its dense clouds are capable of producing lightning, much like the clouds on Earth. Their intermittent appearance indicates a pattern associated with weather activity, and the lightning rate is at least half of that on Earth. 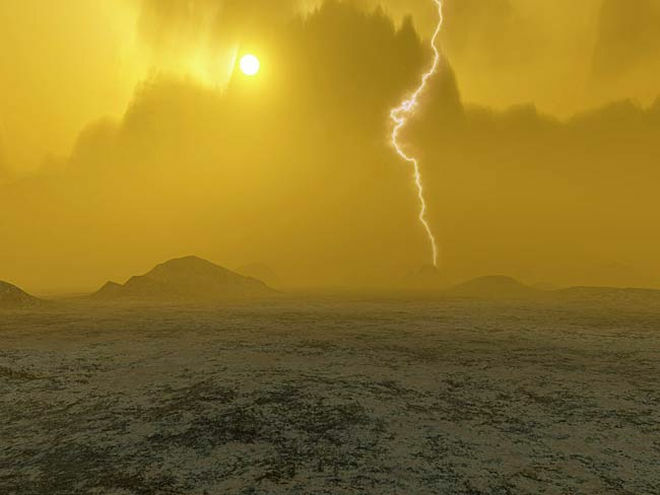 Since Venus does not experience rainfall (except in the form of sulfuric acid), it has been theorized that the lightning is being caused by a volcanic eruption. What is the weather like on Venus? Terrible, would be the short answer. The long answer is that it is extremely hot, the air pressure is extremely high, there are very strong winds, sulfuric acid rain (at higher altitudes) and lightning storms driven by volcanic eruptions. It is little wonder then why the only practical option for colonizing Venus involves creating floating cities above the cloud layer. We have written many articles about Venus for Universe Today. 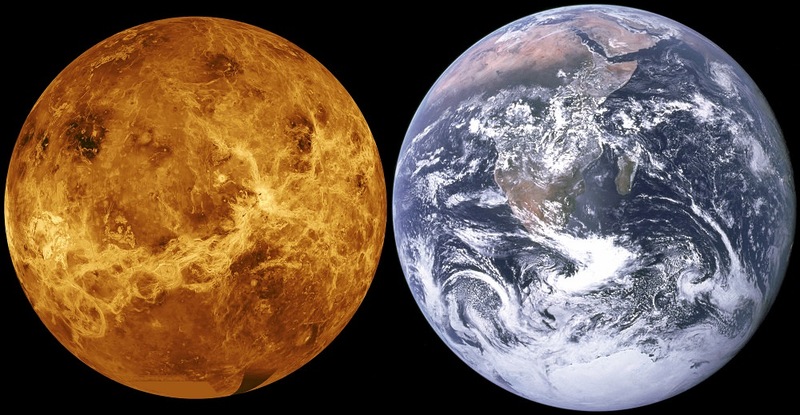 Here’s The Planet Venus, Interesting Facts About Venus, What is the Average Temperature of Venus?, New Map Hints at Venus’ Wet, Volcanic Past, Venus Possibly had Continents, Oceans, How Do We Terraform Venus? and Colonizing Venus With Floating Cities.